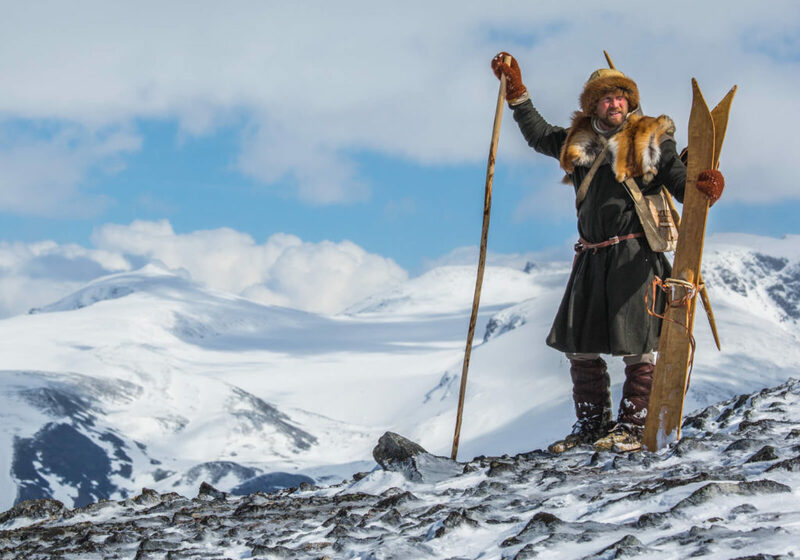 The use of skis for wintertime transport and hunting goes back into the mists of prehistory. The further we go back, the more uncertain and intriguing the story becomes. Mysteries abound. Where did skiing start? Siberia, the Altai Mountains, Scandinavia or somewhere else? The experts disagree. Were skis invented independently in more than one place of origin? There is very little evidence to investigate this. Why did people start using skis? Presumably to make it possible to move around in areas of deep snow, but this is only an educated guess. How did they ski in the past? Not the way we do today, that’s for sure, but otherwise? When was a heel binding used for the first time? When was fur-lining the skis introduced? There are lots of unanswered questions. Many of these unsolved mysteries are a consequence of the sources to the earliest history of skiing. This source material has been limited to skis preserved in lowland bogs, skiers depicted on rock carvings or paintings, or mentioned in written sources. These sources have dried out in the last decades. There is only very limited new information to be gained from the already well-studied preserved skis. With no new material available, the early history of skiing has become a scientific backwater with exhausted sources and little active on-going research. This is a pity, not least since there are still a number of important unanswered questions, as described above. There is also great public interest in the history of skiing, not least in Scandinavia, where skiing is an important part of national history. However, unless new sources appeared, it seemed that the early history of skiing had reached a dead end. The source situation has now changed dramatically. Important early ski-historical material has come to light. Not only are the preserved skis new to ski history, but they are also coming from a new context: not bogs in the lowlands as before, but glaciers and ice patches in extreme and barren landscapes in the high mountains of Norway. The ice in the high mountains is melting due to rising temperatures and climate change. This melt has released many artefacts around the world, especially in the last decade (read more here). This is not least the case in Norway, which holds more than half the artifact finds from glacial ice globally. There are a number of skis among the artifacts from the ice in Norway. These skis hold great scientific promise. So far, they provide new evidence on early ski types, on ski bindings and on the use of fur-lining. It is even possible to use replicas of the ice skis for experimental skiing, learning more about the possibilities and limitations of ancient skis. Last, but not least: Together with the remains of sleds from the ice, these skis tell us a story of human conquest of the high mountains. Secrets of the Ice is happy to present our new publication on the skis from the ice in Norway. 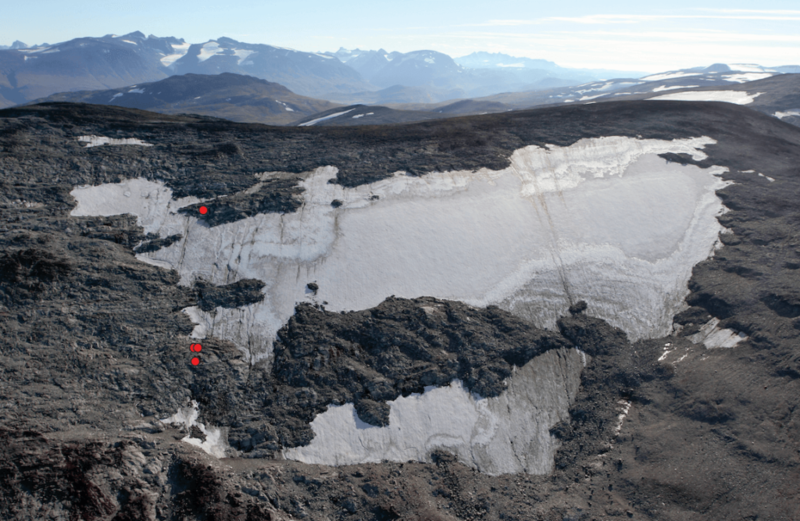 It is published in the Journal of Glacial Archaeology. 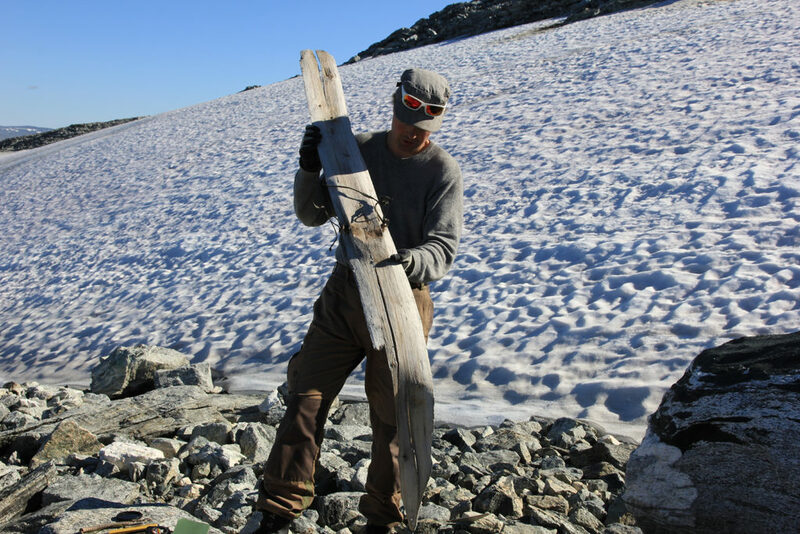 The paper contains detailed information, scale drawings and pictures of the Digervarden ski (c. AD 750), the Lendbreen ski/snow shoe (c. 650 BC) and other skis that have melted out of the ice. 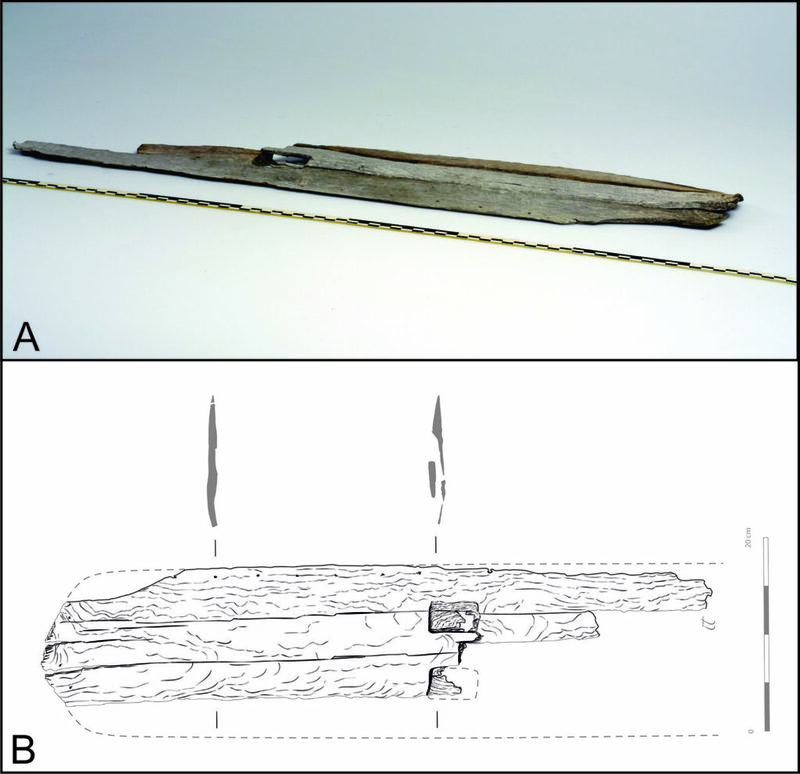 You can download the paper for free here: Prehistoric and Medieval Skis from Glaciers and Ice Patches in Norway. High resolution versions of the illustrations and additional photos and videos can be downloaded here. They are for free use, if credited. Credits are given in the description of each picture. In this blogpost we present the results from the investigations of the two most important ski finds. The other ski finds are described in the paper, so you can access information about them there. We had long had our sights on the Digervarden ice patch in Reinheimen national park. It held great promise for archaeological finds. When the ice patch melted back in 2014, we used the opportunity to dispatch an archaeologist to check it out. After arriving at the ice patch, it only took a couple of minutes before he found an Iron Age arrow. A short while later, he found another arrow, this time from the Bronze Age. Great finds, but little did he know that the really big discovery was still waiting for him at the end of the day. Just as he was about to turn back, he caught sight of a long wooden object. On closer inspection, he saw that it was a ski. The raised foothold alerted him to the great age of the ski. What was even more exciting was that the binding was preserved. A fantastic find. The ski was so large that he had to leave it at the find spot overnight, and return the next day with suitable packing material. The ski quickly found its way to the museum. We submitted a radiocarbon date to the Beta lab in Florida as soon as possible. It came back in two weeks. The ski was from c. AD 750! The Digervarden ski is of a known type – a broad ski with a raised foothold. The same type of ski was used in the lowlands as well. The exciting new aspect of the Digervarden ski is that the binding is preserved. 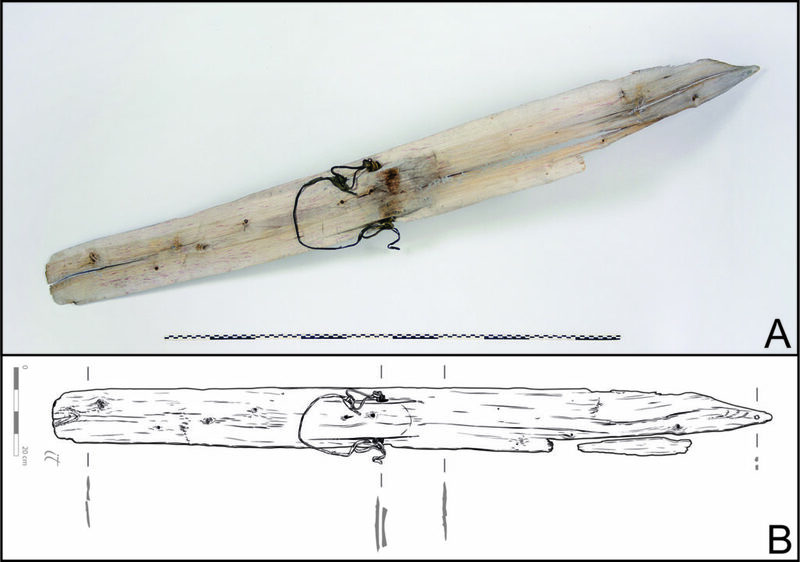 Only one other prehistoric ski in the world has preserved remains of the binding – the Mänttä ski, a slightly older ski from Finland. The Digervarden ski has a toe binding of withe and a leather strap around the heel. A: Detail of the binding of the Digervarden ski. B: Detail of the reconstructed binding. Drawings: Ingvild Tinglum Bøckman, secretsoftheice.com. Types of binding have been much discussed in publications on ski history. 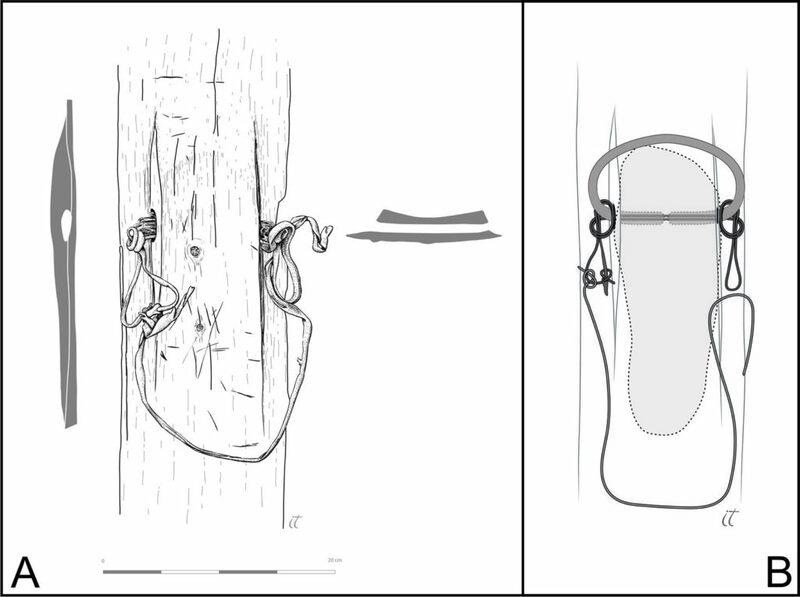 The oldest drawings documenting Norwegian ski bindings are from the 17th century. They depict a toe binding of withe and a heel binding of leather. Sami skis from the last two-three hundred years also have both toe- and heel-binding, but show many different types of binding techniques. 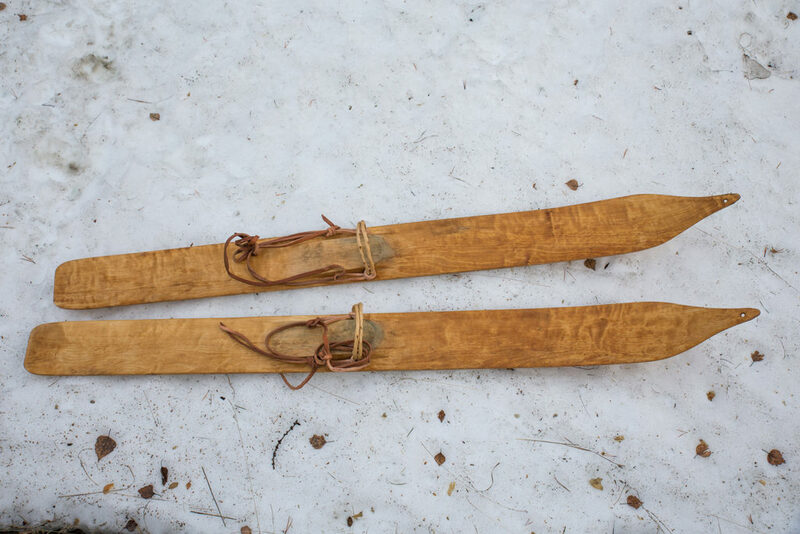 Both the Mänttä ski and the Digervarden ski show that the use of a heel binding goes much further back in time than previously known. Why are heel bindings so important? Skis with a heel-binding make it possible to add power to the step forward and provide a much better stability than skis with just a toe-binding. This is a great help when going uphill. With a heel binding it is also much easier to steer during downhill skiing or while skiing on flats. Replica pair of the Digervarden ski. Reconstruction by Kjell Bengtsen. Photo: Espen Finstad, secretsoftheice.com. The excellently preserved binding and the nearly completely preserved ski has made it possible to make replicas of the Digervarden ski. Even more exciting, it has allowed us to experiment with the replicas, trying out how it is possible to ski on an Iron Age ski. In 2016 we visited the Chinese Altai Mountains and learned about traditional skiing. How did people ski before skiing developed into a sport and leisure activity, which has revolutionised skiing and equipment for the last 150 years? Sadly, traditional skiing is all but lost to the world. Luckily, traditional skiing is still alive in the Chinese Altai Mountains. We visited this area to learn about their way of skiing. 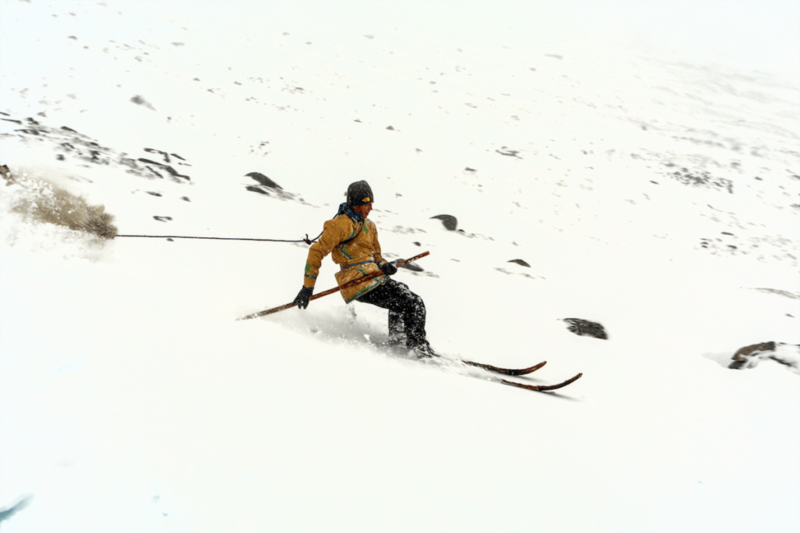 When trying out the Digervarden skis, we used the Altai technique, including the use of a single long ski pole. Dag Inge Bakke skiing with the Digervarden replicas. As you can see from the video above, the Iron Age skis were fully functional. However, the binding on the Digervarden ski is of course not fixed as on modern skis, so trying to set the skis on edge to turn does not work. The large width of the ski makes it suitable for deep snow. In the Chinese Altai Mountains there is still a living tradition of deep snow hunting of deer (see the video above), something that is also known from Norwegian Medieval written sources. This is a very effective technique, where the hunter wears out the deer, before closing in for the kill. Two years ago, we had a visit from the Chinese Altai Mountains. Ma Liqin, one of the traditional skiers, tried out the Digervarden replicas, and he found them functional. However, he raised one question. All the Altai traditional skis are covered in fur to give them traction going uphill, and to hinder them in gaining excessive speed going downhill. After trying out the Digervarden replicas, Ma Liqin was convinced that the Digervarden skis must have been fur-lined to be fully functional. The question of fur-lining brings us to our next find – the Lendbreen ski or snowshoe. This is an enigmatic and unique find that raises a lot of questions. The Lendbreen site is well known by now. It contains a glaciated mountain pass in combination with remains from reindeer hunting. More than 700 artifacts have been collected from this site, including an Iron Age tunic, a complete Viking spear, bones of dead packhorses, remains of sleds and much more. The glaciated mountain pass was discovered in 2011. Frantic fieldwork followed, where we worked long hours to collect as many finds as possible before the snow came. Among the many finds this year was a long straight wooden plank which appeared to be part of a larger object. It had regularly placed holes along one side. We thought that it could be part of a ski, but there was no preserved foothold. It ended up in the “mystery object” category, of which there were quite a few at Lendbreen. In the following years, fieldwork continued at Lendbreen and more finds were collected. In 2012, two smaller pieces of wood were found 300 m further down the slope. They seemed to be some kind of foothold for a ski. However, the type of foothold was different from other early skis. When the Lendbreen material was studied at the Museum of Cultural History in Oslo, it was discovered that the two pieces of the foothold fitted together with the long piece of wood with small holes. They belonged to what had been a type of ski or snowshoe. A year later, a fourth, smaller piece belonging to this object melted out as well. The Lendbreen ice patch with find spots for parts of the ski/snowshoe in red. Illustration: Lars Pilø, secretsoftheice.com. The radiocarbon date showed that the ski/snowshoe belonged to the Late Bronze Age, c. 650 BC. We believe that it was originally lost in the pass area on top of the ice patch. It broke apart here, and pieces were at some point washed down the ice by meltwater. The fact that the three smaller pieces were found in the line of fall from the first piece supports this (see picture). One long side and one end have not been found yet. They may be lost or may still be inside the ice. The ski/snowshoe was probably around 1 m long and 18-20 cm wide. There are no certain remains of a raised tip, but it is hard to see this as a functional ski/snowshoe without one. We believe that the preserved end is the tip, so it is unlikely that the raised tip was at the other, missing end. The Lendbreen ski or snowshoe. The slight bend seen in the mid-fragment is caused by ice deformation of the wood. It is not traces of a raised tip. Photo: Vegard Vike, Museum of Cultural History, University of Oslo. Drawing: Ingvild Tinglum Bøckman, secretsoftheice.com. The Lendbreen ski has a unique type of foothold, unknown in the published Nordic ski material. However, it has some parallels in 18th-19th century short and broad skis from Eastern Siberia. The small holes along the preserved long side are tell-tale signs that that the ski/snowshoe was fur-lined. The holes derive from the fastening of fur-lining with sinew. There are no wear traces on the underside of the ski either, because the underside was protected by fur. This is the earliest known use of fur-lining of skis in the Nordic countries, more than a thousand years older than the Mänttä ski. The Lendbreen ski/snowshoe tells us there is still a lot to learn about ancient skiing. Had it been found in the lowlands, it would have been easy to believe that it was for moving around in deep snow around the winter camp. However, it was found at 1850 m, a long way from any camp in the lowlands. It is unlikely that it was used during the summer season here, as the snow is normally quite firm then and easy to walk on. Outside the ice there would have been no need for a ski/snowshoe. It must have been used in the wintertime, in deep snow. What was the Bronze Age person doing up here in the wintertime – hunting or travelling? One of the most remarkable new results of our glacial archaeology in Oppland is that we can now say with confidence that prehistoric humans travelled and hunted in the high mountains even during winter time. The skis are clear evidence of this, as are the remains of sleds. Prehistoric humans had the technology, the skill and the courage to do so. A new and unknown world of prehistoric ice and snow has been opened up. A reconstruction of an early hunter in the high mountains of Oppland, with replicas of the Digervarden skis and other equipment. Photo: Espen Finstad, secretsoftheice.com. It seems likely that even more ancient skis will appear in the years to come, as the high mountain ice continues to melt. There are still a number of unanswered ski-historical questions. If we are lucky some of the answers will melt out in the years to come. Maybe even the answer to the biggest question of them all: Who were the first skiers? Both the Digervarden ski and the Lendbreen ski/snowshoe are on exhibit at the Norwegian Mountain Center in Lom, Oppland.